Home » Pradyut » Old Wine in a New Bottle or New Wine in an Old Bottle? Old Wine in a New Bottle or New Wine in an Old Bottle? 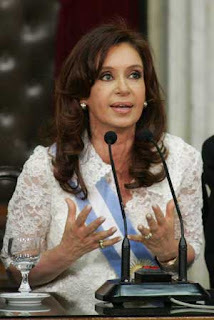 The Latin American nation of Argentina held its National Presidential and Legislative elections on October 23, 2011. The results of these elections were along expected lines, given the wave of populist sentiment the current Government managed to whip up in the run up to the elections. The incumbent President Christina Fernandez de Kirchner has managed to secure a second consecutive term in office after the Front for Victory (FpV) marginally captured over half the seats in the National Congress. Headed by the President, the Front for Victory (FpV) is a coalition party which includes allies like the New Encounter. It is based on the factions of the centre-left Justicialist Party (PJ) that presently owe allegiance to the ruling Government. Fernandez has charted a chequered path, paving the way to her re-election. In 2008, she had suffered a noteworthy decline in support as a consequence of the prolonged imbroglio between the Government and the under-fire agricultural sector. The recessionary situation and the global economic meltdown only amplified her problems. In fact, the reigning Front for Victory (FpV) Government suffered the ignominy of losing its absolute majority in both the houses of Congress during the June 2009 mid term elections. However, Fernandez has managed to stage a gallant albeit gradual recovery in the period following her Government’s mid term debacle that has eventually culminated in her winning her second consecutive term in office. There are numerous plausible factors that have collectively connived and manifested themselves at the right time to contribute to Fernandez’s re-election. A year ago, on October 27, 2011; with her Government under relentless pressure; Fernandez’s husband, Nestor Kirchner died of a sudden heart attack. 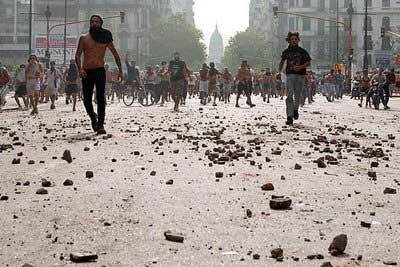 Kirchner was Argentina’s President before his enterprising and politically savvy wife succeeded him in office. Many believed that Fernandez had lost her grip on power and her appetite for another tenure in public office following the death of her husband and most trusted political aide. However, Fernandez displayed remarkable poise and drive as she put aside her personal grief to focus on her Government’s performance and Presidential campaign with renewed vigour. One would be naïve to dismiss the fact that the death of her husband – a much respected and influential Statesman – certainly won her a veritable degree of sympathy from myriad quarters. Suffice to say, the extraneous element of luck has undoubtedly played a role in her re-election. However, the Kirchners at large have been remarkably fortunate during their respective Presidential tenures. It was in the tumultuous year of 2001 that the then moderately developing state of Argentina slipped off the precipice to land itself in a severe debt crisis. Poverty and unemployment soared as the nation and economy per se failed to find a modicum of stability. Five Presidents were elected within a brief period of three years as the country continued to lurch further into the abyss of pressing economic crises. 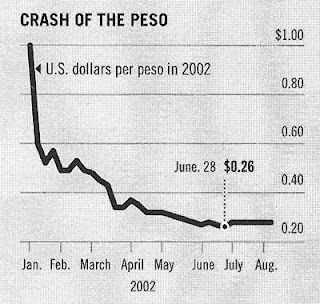 It was one of these temporary Presidents, Eduardo Duhalde that actually succeeded in stemming the rot to a certain extent. Through a sound mix of fiscal and monetary policies coupled with the devaluation of the Peso that was fixed on par with the US Dollar until 2001 and a renewed emphasis on exports, Duhalde managed to put the Argentinean economy on a relatively stable path of progression. However, his year long tenure soon came to an end as he was then succeeded by the late Nestor Kirchner (then the Governor of the Province of Santa Cruz) in 2003. The long term economic and political benefits of Duhalde’s sound developmental strategies were eventually reaped by first Kirchner and then his wife, Christina Fernandez. On account of “inheriting” an economy in improving shape, their task was probably made easier. Fernandez was also aided by the fact that there suddenly was an enhanced demand for farm exports that commanded higher prices in the market and a rapidly burgeoning “next door economy” in the form of Brazil. The mutually beneficial “cross-regional growth effect” stimulated the Argentinean economy as its exports sector boomed. To placate an impoverished population fuelled by angst that had displayed a well documented proclivity to rise in protest against the Government and its perceived apathy, Fernandez focused her attention on expansionary policies. Robust socio-economic progression and Job creation became her cornerstones of ensuing political success. Although inflation continued to escalate at an alarming rate (and still continues to rise. It is presently in the vicinity of about 20%), the Argentinean economy has bounded to register a GDP growth rate of 9.2% in 2010. Many believe that the Government has often resorted to doctoring the figures to suit their needs. However, the veracity of those claims or alleged rumours remains questionable in the absence of substantial evidence. Thus, her carefully calibrated populist measures have certainly gone some way in winning her approval and favour, especially from the lower income strata of society. She has also attempted to ease inflationary pressures on her populace through welfare schemes, state sponsored subsidies and marginal wage rises. Christina Fernandez may have made her way back to the Presidential office riding on a wave of luck, positive sentiment fuelled by populist people-centric measures and sympathy garnered due to her bereavement. However, undeniable is the fact that she does possess the requisite political skill, diplomatic wherewithal and personal leverage to make her second tenure count. However, recent figures are clearly indicative of the fact that economic development is stuttering and industrial performance is slowing down, especially in the wake of the global economic slowdown at large. A new tenure demands a fresh approach to policy formulation, especially in the current global economic scenario. The present rapid growth and expansionary policies are beginning to catch up with the economy, what with Argentina struggling to meet its fiscal deficit targets. There also needs to be a detailed review with regards to the numerous subsidies the Government presently offers, that amount to almost 5% of the GDP. There is a fine line between treading the populist path and hampering long term economic progression by placing undue stress on the economic infrastructure. A renewed focus on attracting greater FDI, encouraging proactive private sector partnerships in critical sectors and gradually reducing widespread Government intervention should also be looked at from a more discerning lens. The road ahead appears daunting…fraught with obstacles. However, it remains to be seen whether Christina Fernandez learns from her previous follies and embraces a more balanced approach towards holistic inclusive growth. Populist measures can be relegated to the back burner for now. The need of the hour is structural economic reforms and privatization drives to stimulate greater demand and counter rising inflation.